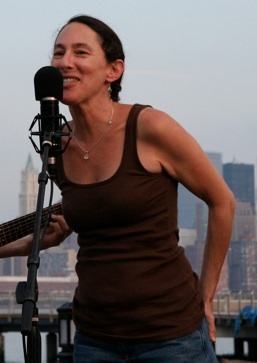 Deena began her music career as co-founder of The Cucumbers, a leading band in the 80s indie pop scene in Hoboken, NJ,with reviews in Rolling Stone and People Magazine and videos on MTV. Deena's songwriting has been called "direct and artful," by the New York Times, her voice "...incredible: kidstuff and wisdom merged," by the Village Voice. Her songs have been recorded by Jackson Browne and Dar Williams and featured in films and on network TV. A blend of alt country and indie pop, with a wink and a twinkle, "Rock River" (released March 2014, Life Force Records) is the second full length CD from Deena. Deena's compelling, charming vocals will draw you into direct, heartfelt songs that reach into the roots of American music, without nostalgia, mixed with a bit of Jersey style rock and roll party spirit, full of harmony, and pop hooks. "Rock River" was included in many critics "Best of 2014" lists including: Popa's Tunes, Jersey Beat, Homegrown Sunday Ramblers, Tom Hull, Cygnus Radio & Popwerpopaholic.